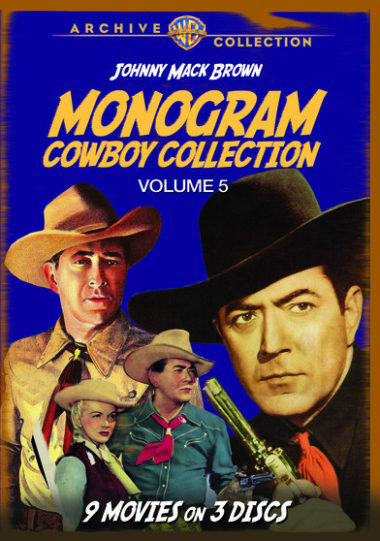 Monogram Cowboy Collection – Vol. 5: Johnny Mack Brown and Raymond Hatton ride in as U.S. Marshals Nevada Jack MacKenzie and Sandy Hopkins, ready to deliver their steely justice to the criminal predators of the plains, in seven of their thrilling six-gun sagas in this Western round-up. And to add some savor to your platter, see Brown saddle up in a bonus pair of classics, as ex-Confederate Captain-turned-Fed Johnny Brownell in Raiders of the South and as himself in Canyon Ambush! Starring: 3 DVD Set – 1943 – 51 – Digitally remastered. Set includes: The Texas Kid (1943) Partners of the Trail (1944) Law Men (1944) Ghost Guns (1944) with Evelyn Finley, Gun Smoke (1945) with Jennifer Holt, Frontier Feud (1945) with Dennis Moore and Christine McIntyre, Border Bandits (1946) with Riley Hill and Rosa Del Rosario, Raiders of the South (1947) with Raymond Hatton in a non-Sandy Hopkins role, as well as Evelyn Brent and Canyon Ambush (1952) with Phyllis Coates.